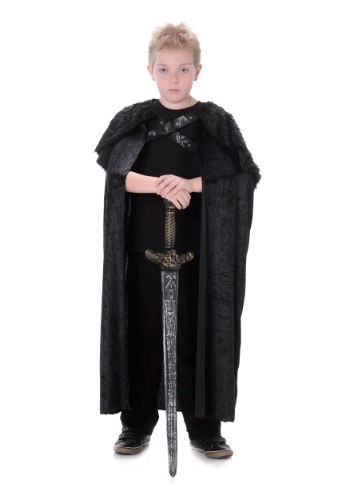 The Northern King black fur cape for kids will make boys and girls feel like a mythical warrior or Renaissance ruler, depending on what accessories are chosen to pair with it. Covered in fur, the robe is warm and perfect for wearing on chilly nights when the mission is to collect as much candy as possible! The Northern King black fur cape for kids fastens around the neck with a tie and hangs down, hovering around the ankles. Faux fur decorates the shoulders, creating a sturdy look that's perfect for playtime or Halloween. Wear the cape alone or pair it with a toy sword and a shield to make a fierce costume. The cape was long for my 8 year old but it looked great.